Even though dogs are somewhere between carnivores and omnivores that consume the organic matter of other animals, they can also be classified as opportunistic herbivores. Dogs have the ability to consume everything from elk antlers to alfalfa, from protein rich beef muscles to nutrient packed blueberries and other foods, thus owners often consider feeding different food items to them, but some human foods dogs can't eat because they're toxic. Not all human food is bad for dogs. There's a number of fruits and veggies that dogs enjoy and can safely consume in moderation. For example, berries like strawberries or cherries, veggies like bell peppers or cucumbers, fruits like bananas or watermelons are not only completely safe for dogs, but even beneficial to their health in many ways. There's also a number of bad human foods dogs can't eat and those may not only be an irritant, but likely fatal to dogs. As more and more food from around the world finds its way into our grocery aisles and into our homes, this “do not feed to dogs list” is growing but there are certain items that are most common, which is why we have some scientific literature on the effects these human foods dogs can't eat have on our pets and what the results are. 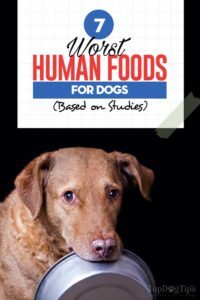 In this article we're taking a look at what research has to tell us about the negative effects these human foods dogs can't eat and risks involved. Know and watch out for the symptoms listed below and if you think that something is amiss, contact your veterinarian. This is clearly a no-brainer. Alcohol is barely consumable for humans, let alone dogs. You have undoubtedly seen what alcohol can do to the human mind, now imagine what it can do to a being a fraction the size and weight of an average person. Yet, it still has to be mentioned on a list of human foods dogs can't eat (or drink) because vets see cases of intoxicated dogs. Unsurprisingly, the effects of alcohol in dogs mimics those of humans. Neurological function is impaired and significant liver damage is observed. However, the effects of alcohol is not limited to these two, which we are all already aware of. It has also been observed that the presence of alcohol in a dog's system lowers the calcium content circulating throughout a dogs system (Peng, et al. 1972). It is believed that the presence of alcohol triggers a calcium movement out of the blood and into tissue, such as bone. This impacts dog's bone and joint health, followed by a number of related complications. On a more physiological level, there is evidence to suggest that alcohol intoxication in dogs leads to a higher mortality rate due to respiratory complications when dogs are severely wounded (Gettler, et al. 1963). This is likely due to the fact that alcohol has a depressant effect on the dog's central nervous system, making it difficult for the body to react to such trauma as acute hemorrhaging. Furthermore, it has been observed that heart function in dogs, particularly the lower ventricles of a canines heart, can be highly compromised by the consumption of alcohol, leading to severe risk of heart problems in intoxicated dogs (Cheng, et al. 1990). When it comes to dogs' brain, consuming alcohol doesn’t necessarily decrease “grey matter” or “brain cells” per se. Rather, studies show that it is actually the white matter in a dogs' brain that thins, making it more susceptible to damage or glial cell loss (Hansen, et al. 1991). While alcohol doesn't necessarily decrease brain cells in dogs, it does make the entire brain of the dog more fragile than it already is is. Cirrhosis is a known consequence of alcohol consumption is humans, and this statement holds true for canines as well. Hepatic cirrhosis, among other ailments, has also been shown in dogs that have consumed alcohol (Chaikoff, et al. 1948). As a result, glomerular and tubular damage (damage to tubes of the dog's kidneys) arise along with lesions in dogs. Suffice it to say that alcohol is easily one of the worst human foods dogs can't eat or drink, and you should never give your dog alcohol. Unfortunate accidents are common because alcohol smells and tastes good and sweet to a dog, and they may go out of the way to seek it out. That’s why if you should ever feel the need to imbibe in libations then do watch your glass to make sure that your pooch keeps their nose and tongue out. Hailing from warm and tropical climates, avocados are often highly regarded for the nutritional and health benefits they bring to humans. It's a source of healthy fats and tons of nutrients, and avocados are a staple in a growing number of homes. However, don’t be so quick to share that guacamole with your dog because avocados are one of the worst human foods dogs can't eat and take off your table. Avocados contain a toxin known as persin, which was shown in studies as very toxic to dogs (Buoro, et al. 1994). 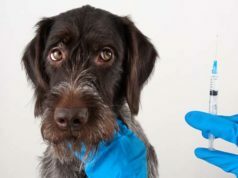 Persin isn’t an issue for humans who can process and pass the substance through their digestive system, but dogs can’t do the same and it ends up accumulating in their system, poisoning them, and causing liver and kidney damage. It has been observed that including avocados in a dog’s diet will lead to considerable damage of the heart and cardiac problems (Kovalkovilcova, et al. 2009). So, while you may consider avocados a delicious, healthy and essential part of your diet, think twice before giving avocado to your dog. Sharing these harmful and toxic human foods dogs can't eat with your companion could leave you faced with a situation where you are rushing Fido to a veterinarian to have their stomach pumped. It's unlikely to come as a shock to most pet owners that onions and garlic are some of the most well-known human foods dogs can't eat and they can be completely devastating to a dog's health. The consumption of a large dose of either can lead to anemia and the destruction of a dog's red blood cell count. Recently, there has been some talk – particularly from holistic veterinarians – that including some garlic can be beneficial to dogs. However, we haven't seen any evidence to suggest that garlic is beneficial to dogs, and most of these assumptions are based on the health benefits observed in humans. To this date, garlic has been shown again and again (Lee, et al. 2000) as toxic and one of the worst human foods dogs can't eat and should never come even close to. A number of health problems have been observed after feeding raw garlic or baked garlic to dogs (Kang, et al. 2009), including hypertension. Similar risks have been associated with feeding onions to dogs as well. When it comes to onions, there have been limited studies (Briggs, et al. 2001) which suggest that onions may potentially benefit dog health; however, there's no way for dogs to consume onions without experiencing side effects. So the fact that a potential adverse effect even exists is enough to merit the omission of onion from a dog's diet altogether. Morning beverages are usually a godsend for people that need a pick-me-up before they get started with their day. Dogs, being creatures of the present, do not need such things. In fact, caffeinated products as some of the worst human foods dogs can't eat or drink, and giving them anything containing caffeine would be a death sentence. In large enough quantities, caffeine is lethal to dogs. Much like in humans, caffeinated beverages (which includes energy drinks like Red Bull) have the ability to cause arrhythmias, heart palpitations, and tachycardia in dogs, according to studies (Mehta, et al. 1997). One study observed (Warszawski, et al. 1977) that particularly susceptible to the fatal effects of caffeine are infant dogs and small breeds due to their size, and how much caffeine their body can handle. It's also due to small and infant dogs having lower blood volume. Metabolism plummets while renal excretion skyrocket (Warszawski, et al. 1982) when pups consume caffeine. Remember that similar to garlic toxicity in dogs, there is no antidote to caffeine poisoning for dogs. Studies show (Tawde, et al. 2012) that caffeine toxicity in dogs is also very difficult to notice, confirm and treat; therefore, place any caffeine products on your list of human foods dogs can't eat or drink, and watch out for those Espresso spills. What begins as a sweet, delicious treat for you, the human, can end up turning your dog into one very sick puppy. While most people already know, it's important to stress the dangers and toxicity of grapes and raisins as some of the worst human foods dogs can't eat. When it comes to feeding grapes or raisins to dogs, kidney failure is the most commonly observed problem (Eubig, et al. 2005). The exact reason why dogs experience renal injury remains unclear to this day; however, enough evidence exists to solidify the link between the two. After the dog ingests raisins or grapes, kidney failure doesn't happen right away. Dogs will typically exhibit bouts of lethargy, vomiting, anorexia and diarrhea beforehand. The dangers apply to all types of grape products: dried, juice, and everything else. The dried raisin, in general, has shown to have a more toxic effect (Stanley, et al. 2008). One may infer that this may be due to the fact that whatever toxin is involved would be more concentrated in the raisin, which is essentially a dried grape. Mention macadamia nuts and pictures of freshly baked cookies or trees gently swaying in the Hawaiian breeze comes into mind. What most people don’t envision is what these nuts can do the insides of their dogs and how one of these human foods dogs can't eat are very dangerous. The consumption of macadamia nuts by dogs can be fatal theoretically when consumed very large amounts, but no deaths have been reported as of yet (Mahdi, et al. 2013). The most likely outcome of a dog eating macadamia nuts is severe illness. The dog is essentially poisoned when they ingest a macadamia nut (Hansen, et al. 2000). They will exhibit symptoms such as involuntary muscle contractions and shakes, fatigue and paralysis, vomiting, elevated temperatures and a spike in heart rate. A subtler yet equally concerning symptom of macadamia nut toxicity in dogs is the development of joint pain and recumbency (inability for the dog to stand or maintain erect for stretches of time). It seems that macadamia nuts target and affect the limbic system of canines (McKenzie, 2007) and any prolonged changes in a dog's posture (asides those inflicted by aging) should be a clear sign that the dog should visit the veterinarian as soon as possible. Perhaps the most commonly known among human foods dogs can't eat, chocolate has a great potential to kill a dog. This isn't mentioned often for posterity or as a scare tactic. Chocolate is considered deadly for dogs and should be avoided like the plague. The compound known as theobromine in chocolate is well-known as a real killer of dogs (Strachan, et al. 1994). A mere lick of chocolate, especially darker chocolates untainted by the addition of milk, can send a dog spiraling through bouts of thirst, vomiting, diarrhea, arrhythmia, muscle tremors, seizures and then death. While other species have been known to negatively react to chocolate as well (Miller, et al. 1984), it seems that dogs are most susceptible. Your dog eating chocolate when you are not around is probably the most common situation – dogs love the taste and smell of chocolate. The biggest problems is not only that a dog has eaten a toxic substance, but also because you do not know how much was consumed nor how much time has elapsed since consumption, which is one of the most important factors for assessment (Finlay, 2005). Fortunately, and unlike with garlic or caffeine, there are treatments and protocols (Ghazaleh, et al. 2008; PDF) that exist for treating dogs with chocolate poisoning. Since dogs that consume chocolate exhibit behaviors that effectively eliminates fluids from their body, it is essential to replace those liquids, making rehydration a first priority in case of chocolate poisoning in dogs. Again, unlike with some other bad human foods dogs can't eat, there's also medication you can use. Atropine sulphate and dexamethasone ensures that the dog's system receives a significant boost of energy to fight off the illness, while an assortment of other drugs (to be prescribe on a case by case basis), helps them recover to the point where their own systems can take over, according to several experiments (Stidworthy, et al. 1994). Peng TC, Cooper CW, Munson PL. The hypocalcemic effect of ethyl alcohol in rats and dogs. Endocrinology. 1972 Aug;91(2):586-93. Gettler, D. T., & Allbritten, F. F. (1963). Effect of Alcohol Intoxication on the Respiratory Exchange and Mortality Rate Associated with Acute Hemorrhage in Anesthetized Dogs. Annals of Surgery, 158(2), 151–158. Cheng, C. P., Shihabi, Z., & Little, W. C. (1990). Acute effects of mildly intoxicating levels of alcohol on left ventricular function in conscious dogs. Journal of Clinical Investigation, 85(6), 1858–1865. Hansen LA1, Natelson BH, Lemere C, Niemann W, De Teresa R, Regan TJ, Masliah E, Terry RD. Alcohol-induced brain changes in dogs. Arch Neurol. 1991 Sep;48(9):939-42. CHAIKOFF IL, ENTENMAN C, et al. Pathologic reactions in the livers and kidneys of dogs fed alcohol while maintained on a high protein diet. Arch Pathol (Chic). 1948 Apr;45(4):435-46. Buoro IB1, Nyamwange SB, Chai D, Munyua SM. Putative avocado toxicity in two dogs. Onderstepoort J Vet Res. 1994 Mar;61(1):107-9. Lee KW1, Yamato O, Tajima M, Kuraoka M, Omae S, Maede Y. Hematologic changes associated with the appearance of eccentrocytes after intragastric administration of garlic extract to dogs. Am J Vet Res. 2000 Nov;61(11):1446-50. Kang MH1, Park HM. Hypertension after ingestion of baked garlic (Allium sativum) in a dog. J Vet Med Sci. 2010 Apr;72(4):515-8. Epub 2009 Dec 16. Briggs WH1, Folts JD, Osman HE, Goldman IL. Administration of raw onion inhibits platelet-mediated thrombosis in dogs. J Nutr. 2001 Oct;131(10):2619-22. Mehta A1, Jain AC, Mehta MC, Billie M. Caffeine and cardiac arrhythmias. An experimental study in dogs with review of literature. Acta Cardiol. 1997;52(3):273-83. Warszawski D, Gorodischer R, Moses SW, Bark H. Caffeine pharmacokinetics in young and adult dogs. Biol Neonate. 1977;32(3-4):138-42. Warszawski D, Ben-Zvi Z, Gorodischer R, Arnaud MJ, Bracco I. Urinary metabolites of caffeine in young dogs. Drug Metab Dispos. 1982 Jul-Aug;10(4):424-8. Eubig PA1, Brady MS, Gwaltney-Brant SM, Khan SA, Mazzaferro EM, Morrow CM. Acute renal failure in dogs after the ingestion of grapes or raisins: a retrospective evaluation of 43 dogs (1992-2002). J Vet Intern Med. 2005 Sep-Oct;19(5):663-74. Stanley, S. W., & Langston, C. E. (2008). Hemodialysis in a dog with acute renal failure from currant toxicity. The Canadian Veterinary Journal, 49(1), 63–66. Hansen SR1, Buck WB, Meerdink G, Khan SA. Weakness, tremors, and depression associated with macadamia nuts in dogs. Vet Hum Toxicol. 2000 Feb;42(1):18-21. McKenzie RA1. Poisoning of companion animals by garden and house plants in Queensland: a veterinary practice survey. Aust Vet J. 2007 Nov;85(11):467-8. Strachan ER, Bennett A. Theobromine poisoning in dogs. Vet Rec. 1994 Mar 12;134(11):284. Miller GE, Radulovic LL, DeWit RH, Brabec MJ, Tarka SM, Cornish HH. Comparative theobromine metabolism in five mammalian species. Drug Metab Dispos. 1984 Mar-Apr;12(2):154-60. Finlay, F., & Guiton, S. (2005). Chocolate poisoning. BMJ : British Medical Journal, 331(7517), 633. Stidworthy MF, Bleakley JS, Cheeseman MT, Kelly DF. 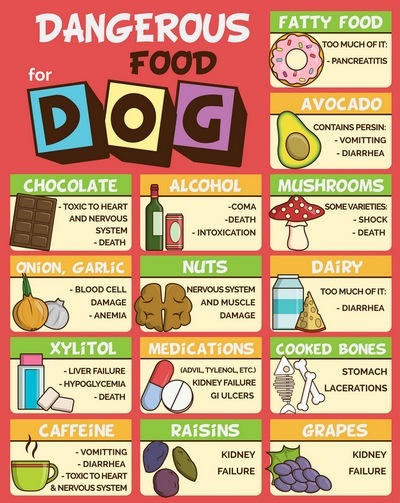 Chocolate poisoning in dogs. Vet Rec. 1997 Jul 5;141(1):28. Next articleWhat are Designer Dogs? Mary has a Bachelor of Science in Biology and Neuroscience, and has been specializing in animal science writing for over ten years. She's very experienced in scientific reports, data analysis and science-based research, and obsessed with accurate information.